Earlier today, Toronto and Region Conservation Authority (TRCA) hosted a special event at McMichael Canadian Art Collection to kick off the 20th anniversary celebration of the Humber River’s Canadian Heritage River designation. Speakers at the event included Her Honour the Honourable Elizabeth Dowdeswell, Lieutenant Governor of Ontario, as well as Jennifer Innis, Chair of TRCA’s Board of Directors and Stephen Lecce, Member of Provincial Parliament for King–Vaughan, among others. The event also featured an Indigenous blessing and welcome by Elder Garry Sault from Mississaugas of the Credit First Nation. Front Row: Elder Garry Sault, Mississaugas of the Credit First Nation (left) and Her Honour the Honourable Elizabeth Dowdeswell, Lieutenant Governor of Ontario. Back Row: (left to right) Sarah Milroy, Acting Executive Director, McMichael Canadian Art Collection; John MacKenzie, Chief Executive Officer, TRCA; Jennifer Innis, Chair, TRCA Board of Directors; Linda Jackson, Regional Councillor, City of Vaughan; and Chandra Sharma, Director, Community Engagement and Outreach, TRCA. 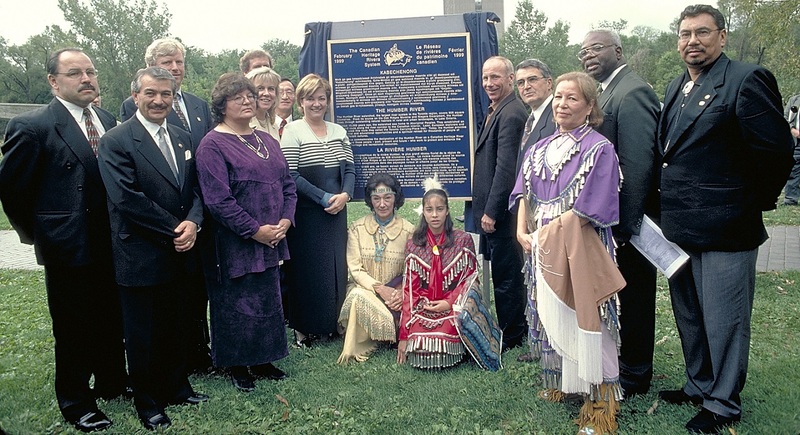 In 1999, the Humber River received official designation under the Canadian Heritage Rivers System for its significant cultural heritage and recreational values, thanks to the collaborative efforts of TRCA, the Humber Heritage Committee and dedicated community members. The Humber has a rich human history: as a home for Indigenous peoples along its banks, as an ancient transportation route known as the Carrying Place Trail and as a site for many of Toronto’s post-European settlement homes and industries. It is one of just 39 Heritage Rivers across Canada, and the only designated river in the Greater Toronto Area. The Humber River was designated to the Canadian Heritage Rivers System in 1999. TRCA and its partners have planned a wide range of activities to take place in the Humber River watershed this year, including Humber by Canoe, Black Creek Community Farm Festival and Kids’ Run for Nature at Claireville Conservation Area. For more information on upcoming events, please visit the TRCA calendar.